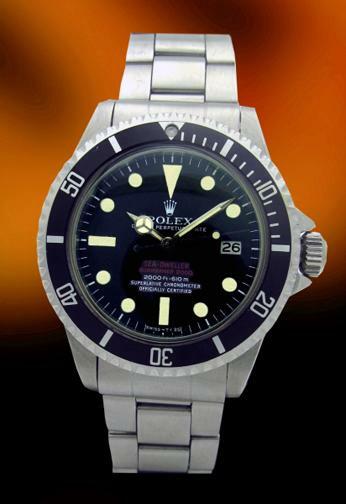 Rolex 1665 - "double red" Sea-Dweller, amazing condition, stainless steel case, absolutely beautiful example. This is just a great Double Red Sea-Dweller, offered here in mint condition. Original stainless steel case measures 40mm diameter by 17mm thick. Crystal is domed acrylic. The original TripLock crown screws down smoothly and operates perfectly. The original bezel turns with the proper amount of resistance. The case is very clean and mint. Inside case back has the watch's serial number engraved by Rolex along with the '1665' model number. Movement is the automatic winding Rolex Caliber 1570 with 26 jewels, adjusted to 5 positions and temperature, and is a C.O.S.C. Certified Chronometer. Movement is in perfect condition and is running well.